Executive Summary - One of the best reward card in the market because you can earn 3X points on airfare and very few cards allow you to do earn that. If your business has advertising, gasoline and shipping expense, you will also be able to earn faster rewards. The discounts you can get with OPEN partners make this card even more formidable. American Express always had their "Business" version of their Gold charge card. But when they launched the "Premier Rewards" version in the consumer space, the business lagged slightly behind in terms of rewards. But they totally revamped this card in 20111 with new reward features that very few cards actually offer. For the business owner who travels, spends some money on advertising, and also pay in full every month, this card will probably come close to being on your top of your list. Let's start with the benefits and rewards of this card. Airline Expenses - For those who fly a lot, this card is great because you can earn triple points for every dollar that you spend on airline expense. This includes both domestic and international flights. Whether you book your travel on Amex own travel booking site or directly through airlines, you will earn triple points. However, you will not earn triple points if you book charter flights or with a tour operator. Many airline affinity cards do not even allow you to earn triple points on their own card, so this is a real bonus. Select Media, Gas, Shipping - Aside from Airline expense, you can also earn double points when you use the card at standalone gas stations, select media and shipping expenses. It is worth explaining a couple of definitions here. Firstly, let's start with gasoline. Standalone gas stations are stations like Exxon, Sunocco, BP, Lukoil who are classified as "standalone". Gas stations from Costco, Walmart, Kroger are not considered as standalone and you will not earn double points when you use them. For example, if you use Costco gas stations a lot, you will earn 3% rebates only if you use Costco's affinity card. Advertising expenses includes those marketing dollars spent online on google adwords and facebook ads. In fact, this feature is specifically targeted at small businesses as research has shown that more of them will be allocating their ad budgets online going forward. Having this card is a great way to earn extra reward points. The ability to earn double points on shipping expenses is great for businesses who ship a lot of goods. It is good only for shipping in the US and includes, postal, courier and freight charges. Select Computer Hardware and Software Stores - This new features has just been added to this card. For business that need to purchase computer stuff, the ability to earn double points can only be good news. $100,000 cap - One thing to note is that for these categories that allow you to earn more than one point (airline, gas, advertising and shipping), you can earn the extra points per dollar for up to $100,000 in spending per category. If you exceed the cap, you will just earn one point per dollar for spending that has exceeded it. For other regular purchases, you will earn one point. OPEN Network - Being a small business card from American Express, this card is part of their OPEN network. It means that it comes with various "OPEN" perks. The first perk is that OPEN has a variety of merchant partners which will enable you to get discounts. The following screenshots show OPEN's merchant partners. To aid businesses in their online marketing venture, OPEN also has some apps like youbuzz, ad manager and search manager. These tools help in managing social media presence, per per click ad campaigns. Access to Special Events - American Express sponsors lots of events every year. And because of that, they are able to give advance booking notices to their cardholders. The card calls this feature Gold Card Events. Aside from this, this card also provides event ticket reimbursement in the event that you cannot attend. Identity Theft Assistance - Cardholders are also given 24/7 assistance should their "identity get stolen". Other Standard Amex Features - This card also comes with the standard Amex features like loss luggage insurance, warranty extension, purchase protection, guaranteed room reservations, 27/7 assistance when you travel overseas. 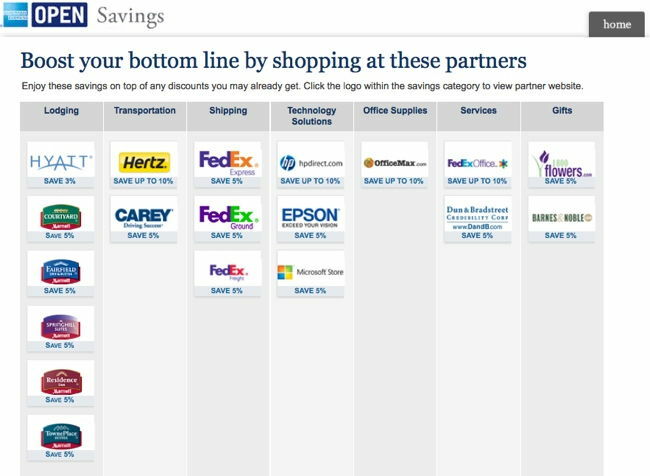 Now that we have had a big picture overview of the card, let us now look at their airline travel partners (a very common question).